Took a bus to the Canyon and it was beautiful. Took a bus to the Canyon and it was beautiful. Not as grandiose as the Grand Canyon but still beautiful. We stopped along the way going and coming at several other scenic areas. This visit was part of an all day excursion. We booked the Discover Kauai and Luau excursion through NCL. We booked the Discover Kauai and Luau excursion through NCL. 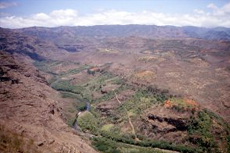 There were a few fun stops, and the Waimea Canyon was the highlight of the tour. The Luau was fantastic. It was an incredible show, and the food was delicious. Beautiful island! Amazing flowers! Might have preferred to rent a car one day do some hiking. Beautiful views of the Canyon. Boarded a large bus, did the canyon and also went to a coffee plantation and tasting. Great tour and an even better guide. Great tour and an even better guide. Cousin Moy was the best! First time here and want to go back-scenery was fantastic with all the colors. First time here and want to go back-scenery was fantastic with all the colors. Booked tour with Roberts Hawaii as part of a package they offered for this cruise. Very pretty, informative and chatty bus driver (again, Roberts). Very pretty, informative and chatty bus driver (again, Roberts). Scary ride up to canyon. Incredible views. it was all in one tour and our tour guide was very good and we had a very good time. We really enjoyed seeing Waimea Canyon and Fern Grotto. Here we rented a car very easily. Here we rented a car very easily. It was a beautiful island to drive. Stopped at a little place called the Shrimp Shack for lunch. Wonderful experience overall. See the Napali coast! I would come back. Bus excursion to Waimea Canyon. Bus excursion to Waimea Canyon. Once there, outstanding, beautiful views of the canyon with its many colors.